This photograph is one of my favorites, not only are the colors stunning, but it also gives us a fine example of how timeless life along the Nile is. This scene has not changed much since people began to settle in this valley. The women are busy doing their daily chores. They will take the time and wave to the boats as they sail by. I’m told, this is a custom that dates back to when people would run to the rivers edge to get a glimpse of the mighty Pharaohs majestic fleet as it sailed by. Whether this story is true or not, it surely fires the imagination. These women are watering their livestock and doing the laundry. 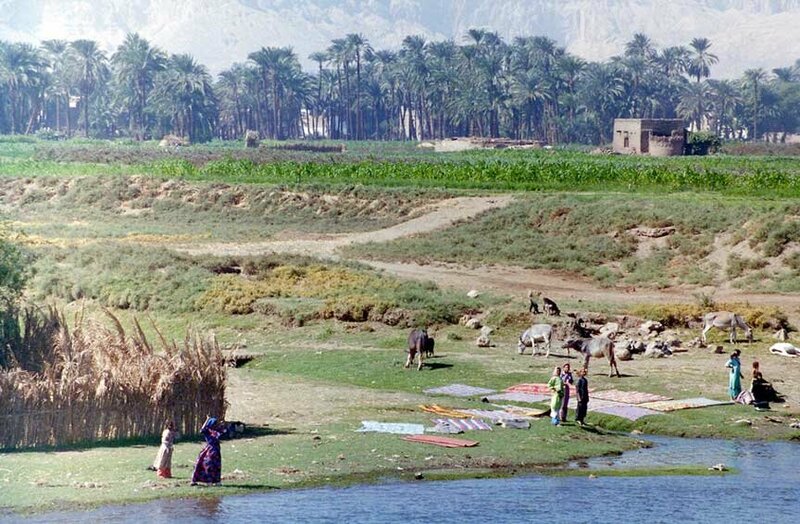 The Nile is still the most important thing in their lives, it is their source of life giving water and today it is also their washing machine. Behind them are the crops that their village relies on, in these fields is where you will find the men of the village hard at work. The mud brick home is similar to those built by their ancestors. Behind the tree line you can see the cliffs that mark the edge of the western desert, this was Egypt’s best defence against invaders from the west. This thin strip of land that you see between the river and the cliffs is typical of the amount of land that the Egyptians had to live on.